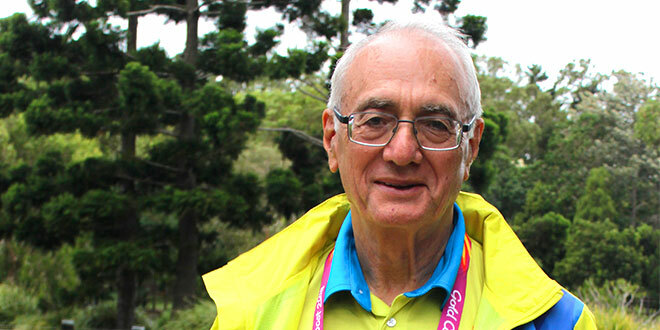 MISSIONARY priest Fr Warren Kinne is looking forward to one of the more unusual challenges of his religious life – he has signed up as an official Commonwealth Games chaplain. “There will be surprises on the track and in the pool, and there could well be surprises of the spirit,” he said. Fr Kinne, who turns 72 in May, spent two decades as a Columban missionary priest in communist China. He returned to Australia last year and now lives on the Gold Coast working in parishes and as a student chaplain at Griffith University. He has joined the army of volunteers preparing for the Gold Coast Commonwealth Games and 11 days of world class sporting competition in April. “It will be spectacular, and I’m happy to be part of the action,” Fr Kinne said. Fr Kinne will join chaplains and representatives from 16 religions and faith organisations, providing services and pastoral care at the Gold Coast athletes’ village – a home away from home for an estimated 6600 athletes and support staff from 70 Commonwealth countries. In the heart of the village a multi-faith centre is the religious hub is where Fr Kinne will celebrate Mass, sharing the facility with other faith communities including the four main religions represented – Christian, Buddhist, Hindu and Islam. Another Catholic chaplain, Helen Day, will be on hand – part of a team of volunteers offering pastoral care and support at the centre from 7am to 11pm throughout the Games. “We’re going to have a significant number of Catholic athletes and their supporters and coaches and so it is good to have a profile there,” Fr Kinne said. Fr Kinne said Catholics attending the Games might want to visit local parishes, with many families of athletes and tourists staying right across the Coast. The number of visitors is expected to swell to 100,000. “Mary Immaculate (Ashmore) would be the closest church in walking distance, but also they could hop on a tram and attend Guardian Angels Church in the middle of Southport,” Fr Kinne said. Fr Kinne has a strong connection with sport. He was a champion swimmer growing up in Bundaberg, where he attended Christian Brothers’ College. After graduating as dux of the school, he studied to become a Columban priest. His missionary path led to the Philippines in the early 1970s, and then to positions within the society in Australia and Ireland and doctoral studies in England. In 1997 he was sent to China – first to Beijing and then Shanghai, where he taught and developed an active ministry working with poor migrant families who had moved from the countryside to find work. Fr Kinne witnessed the Church flourishing in some regions of China, while it was driven underground elsewhere. Fr Kinne keeps his China connection alive, with more than 900 Chinese students studying at Griffith University’s Gold Coast campus. He also assists by celebrating Mass in Surfers Paradise and neighbouring parishes.